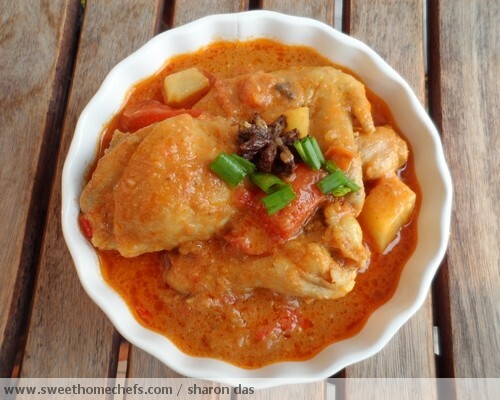 It's chicken curry day! Cooking curry is usually reserved for Sundays in my family. This is because of the amount of work involved. Mom's a firm believer of the "pound with pestle and mortar" method. She's been pounding chilies, onions and garlic for years! I prefer the electric blender ....shhHhh.. 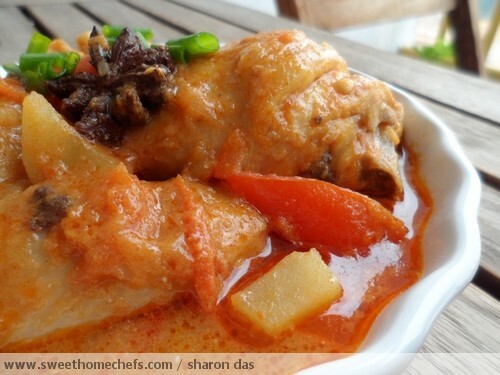 This is my version of yummy Tomato Chicken Curry. It's been sometime since I last cooked tomato curry. I've forgotten what really goes into it so I've come out with this new version, which is not bad either - an aromatic, tomato rich flavoured dish which does not come with an overpowering taste of curry powder. I am someone who loves curry but I don't quite fancy curries with that powdery taste so I tend to cut down on the powder or add on other ingredients to balance things out. Anyway, this is the recipe. Quite a number of ingredients in there but very easy to cook and well worth the effort. 1) Blend onion, garlic and ginger together (with a bit of water if necessary), into a rough paste. Set aside. 2) Mix coriander and curry powder with a bit of water, into a wet paste. Set aside. 3) Heat cooking oil in pot. Pour in garlic, onion and ginger paste. Add cinnamon sticks, star anise and cardamom pods. Fry until fragrant. 5) Season with salt, and soy sauce (optional). Lower the heat and stir in cooking cream. Mix well and that's it. Serve garnished with chopped spring onions if you like. I am cooking this today, i skip the potato and cream. It taste nice too!. Thanks for the recipe.